Midway through his post-match press conference, England head coach Eddie Jones was thrown a question about Scotland and their never-ending angst in the Six Nations, now standing at eight losses in a row with a trip to Cardiff to come on Saturday. It was a gatecrash question, one that burst in on his over-the-top acclamation of England's victory - hard-earned and valuable but dull and unconvincing - and the men who made it happen. Jones had earlier said that England had won easily, which was a stretch, but winners get to say what they like in these situations. Jones fixed his questioner and verbally ducked away from him. As far as side-steps went, it was the niftiest of the day. "Aw mate," he said, politely, "I don't talk about the opposition." At the back of the room there was a muffled laugh: "Since when?" The England coach is never going to be mistaken for rugby's Kofi Annan, and so the diplomacy didn't last. The very next question was also about Scotland and this time he couldn't stop himself. Eddie Jones: "I don't talk about the opposition"
Was he worried about Scotland at the break after seeing them finish strongly in that opening half? No, he most definitely was not. "Our data on Scotland was that they score 69% of their points in the first 30 minutes of games," he said. He didn't elaborate, but he didn't need to. The message was clear: contain Scotland for half an hour and everything becomes easier. Then he smiled that Eddie Jones smile, knowing, surely, that he'd launched a grenade long after the battle was over. Why? Just because. The depiction of Scotland as a team that all but ran out of scoring threat after only 30 minutes was a brutal one, a harsh word on their ability, their fitness and maybe even their heart. It was a damning comment delivered deadpan. Jones is rugby's arch trash-talker. Much of what he says has to be put through a sieve to drain the mischief from the meaningful, but this was a bit of both. Some devilment, for sure, but some detail, also. Detail that makes you wince for Scotland. Saturday's Calcutta Cup loss was Scotland's eighth successive defeat in the Six Nations. In those eight wins Jones had it that Scotland scored 69% of their points in the opening 30 minutes. It's actually 68%, not that it makes much difference. His analysis stands. If anything, you could make it look worse. In those eight straight losses Scotland have scored 78% of their points in the first half. In four of the games, Scotland didn't score at all in the second half. In three others, including Saturday at Murrayfield, they scored just three points after the break. In their past eight Six Nations games, Scotland have scored a cumulative total of 22 points in the second half. Twenty-two. It's a number you almost have to keep saying over and over in your head in order to believe it. Eight halves of Six Nations rugby, 320 minutes, 22 points. Even when you repeat it, it scarcely computes. Jones over-egged his own team's performance after his first Calcutta Cup as England coach, but on Scotland's capacity to fade, and fade horrendously, he was dead-eye accurate. Never mind the new dawn, any kind of dawn would suffice for Scotland right now. Anything that offers light, instead of dark, would do. The monotony of Scotland's inability to change the narrative is unchecked. There are some outstanding players and some seriously wise coaches at work here, but the story never changes. Finn Russell still hasn't won a Six Nations match. Neither have Mark Bennett and Jonny Gray, players of vast promise. Of the men who saw action for Scotland on Saturday, 10 of them still don't know what it feels like to win a game in this championship, albeit three - WP Nel, John Hardie and Zander Fagerson were getting their first experience of it. There were moments they'll all torment themselves with this week. One of them came just before the hour mark when Ben Youngs threw one of those passes that has intercept written all over it the second it leaves the hands. England were deep in Scotland territory at the time, moving left to right in their 22 and looking to add to their six-point lead. Youngs was not long on the field and not dialled-in to the pitch of the game. His pass was short of its target and potentially costly for his team. Russell gobbled it up and the stadium got to its feet. There was vast acreage between the Scotland stand-off and the England try-line, but this was a chance, no doubt about it. Scotland had wasted good field position at the end of the first half and at the beginning of the second and this was another moment that would pass, another half-opportunity spurned. Almost as a reflex action, done in shock and relief at lifting the siege, Russell put boot to ball and hoofed it into touch. Had he looked, he would have seen Stuart Hogg running free outside him. Hogg would have taken some stopping, but the ball never came. In the moment, both men smiled at each other in frustration, but this was one of the stories of the day, and the era, for Scotland. Chances come and chances go and the results stay the same. Alasdair Dickinson spoke in the aftermath, his face reddened from battle. "We need to stop doing this to ourselves," he said, when asked about Scotland's latest false dawn. It was as plaintive a cry as you'll hear from a genuinely tough rugby man. Dickinson was hurting, that much was obvious. He looked confused and frustrated. He searched around for answers and kept coming back to the wasted moments; the lapses in concentration; the lack of accuracy; the spilled balls; the missed tackles; the aerial challenges they lost that they needed to win. Small things, but huge things. The loose-head has been in this movie before. 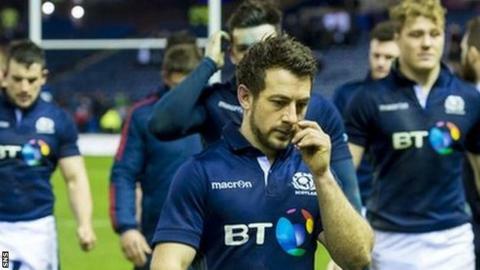 The wearying familiarity of it all was unmistakeable in his demeanour and in the body language of all the jaded Scottish fans who exited Murrayfield on Saturday. Gallows humour was the order of the night again.